Bespoke creations define the very essence of Damian By Mischelle. This work is the foundation of the passion that we share with every client. 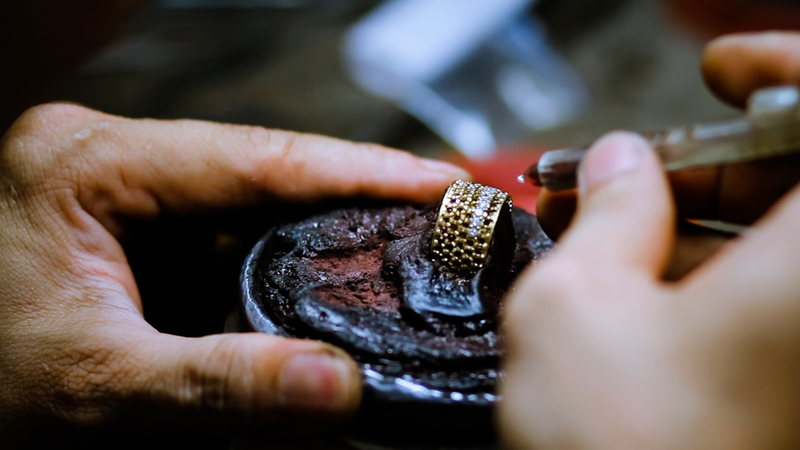 And each piece of fine jewelry that we produce tells a unique story about the owner. Much of our commission work involves re-setting family pieces and breathing new life into heirloom gemstones. We preserve the heritage but layer this with a more seductive balance of colours, shapes and forms. We often mix different materials, such as mother of pearl or perhaps exotic leather, and bring different gemstones into the composition. All of this combines to create a design that is a true one-off. An exceptional, unique piece inspired by the client and created exclusively for them. Damian By Mischelle undertakes a wide range of one-off commission work for our clients. This includes highly complex wedding sets, spectacular engagement rings, anniversary pieces for both him and for her and celebration work to commemorate the birth of children. We also work very closely with our clients to reset many family gems that have, perhaps, been passed through the generations. Our chief designer finds spectacular ways of presenting a very modern interpretation for these treasured pieces. However, the design and production capability extends still further. Our work includes diamond and ruby encrusted key chains for very special cars, jeweled collars for the canine members of the family, creating bling make-overs for mobile phones and even adding rows of definite sparkle to our own hand made crocodile business card holders. Your imagination is the only limit to what is possible. Timelines for commission work vary enormously but you can commence the dialogue by contacting us here. This beautifully cut oblong red garnet was the beginning of this bespoke project. The client originally considered using it for a pendant but we ultmately decided that a ring could be more dramatic. Placing it along the length of the finger required a wider base so a band was created using black diamonds set onto white gold. The colour and texture in the base proved to be the perfect contrast for the feature garnet on top. Our client loves blue and wanted a ring that she was easy to wear, whether it was for company meetings or collecting the kids from playgroup. The ribbon design was chosen to wrap around the finger. It has a relatively low profile against the hand and we set each of the strands with natural blue sapphires edged with white diamonds. The end result is both practical to wear but it still has enough wow factor for when the occasion arises. A daily wear bangle was required for this bespoke project. It had to be both practical but also able to be dressed up. We began with stingray because it is one of the most durable exotic leathers. The ends of the bangle were given a touch of glamour with 18k white gold tips set with round white diamonds. Finishing the piece with a final flourish we added a diamond set clasp. Delicate, feather light and yet devastatingly chic - this was the concept for the ever decreasing circles. These earrings combine rows of white diamonds with rose coloured gold to create a soft, seductive frame for the face. For this project for a male client we started with a beautiful royal blue 6.56ct Burmese sapphire. To compliment the feature gemstone we layered blue ostrich around the band and used rose coloured gold to match his favourite tourbillon watch. The carving on the inside of the band was the finishing detail to this bespoke creation. One of our female clients came to us with this wonderful 37ct black diamond. Our design team was inspired by the age of the Victorian sautoir and wrapped it in this white diamond-encrusted cage. To provide some visual lift to the overall piece rubies were alternated with marquise-cut white diamonds in the sautoir chain. The final effect is suitably dramatic ! This gorgeous pair of 6ct D IF heart shaped diamonds were lying in the bottom of a client's safe. Our design team brought them to life using a combination of baguette and round white diamonds in a pair of unforgettable earrings. Now they truly dazzle wherever they go. Our client had a very specific set of criteria. She wanted a totally natural Colombian emerald. It had to be pear shaped and it had to be at least 6ct. After an exhaustive search we eventually sourced a perfect 6.55ct emerald direct from Colombia with no oil treatment of any kind. We were entranced by the vibrant colour and so was the client. Inspired by the Colombian rain forest, our design team created this baguette-set pendant as a stunning mount for this rare green beauty. Our client wanted a sautoir that was both dramatic and with a hint of art deco about it. And she loves pearls. So the design team took the pearl has a repeating theme creating two virtual pearls out of black and white diamonds whilst using a silver pearl as the centrepiece within the feature orb. The chain followed the art deco theme with extended segments that echo the flavour of the 1920’s. And today this remains one of our favourite bespoke pieces. This one-off set presented a major technical challenge. The design team had a vision of an infinity of interlocking circles glittering like the stars in the night sky. The atelier team transformed this into a universe of microset diamonds that encircle the wearer in sparkling light. A yellow diamond can sometimes benefit from some unexpected contrast. So, for this bespoke project our design team paired an 8.48ct cushion cut fancy yellow with a square base set with almost 9cts of black diamonds. A sparkling combination that is simultaneously contrasting and yet complimentary.